Lillian Thompson June 6, 2018 Global Afro Woman ProtagonistLeave a Comment on Naomi Wadler Future of Youth Activism! Naomi 11 years old activist against gun violence. 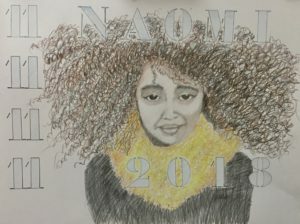 Naomi Wadler, at eleven years old, sparked the imagination of many around the world. This adopted Ethiopian-American youth was asked, by her elected official representing Alexandria, Virginia, to speak at the Parkland inspired ‘Gun Against Violence’ national demonstration in March 2018. She volunteered to give voice honoring African American teenage girls murdered by gun violence. Naomi has added another level of awareness to the reality of gun violence within the nation’s capital black community along side school shootings. Naomi is not new to activism. She organized a walk out at her school against gun violence. Her participation in this event with the Parkland students, has given her national recognition as a measured speaker with youthful wisdom in delivering a message to an engaged and spell bound equally youthful audience. That loss of 17 lives, in the close nit community, including three teachers was a national tragedy sparking a global student protest movement, yielding some legislative successes and beginning a nationwide voter registration drive. Naomi’s passion came earlier then her eleven years. Her clarity about what is right with fearlessness to challenge those around her. This ‘Global Afro Youth’ captures confidence, awareness, presence, and resolve in delivering a message for little girls like herself who can think and make wise decisions against what they see as wrong. She represents our future and knowing this makes her an important voice as our protagonist. We encourage her success!